Beneath the radar of the corporate music world there are gems to be found. Greg Greenway is a multi-faceted one. A rare combination of instrumental expertise, a soulful and moving singer, powerful poet, and sparkling entertainer, Greenway is one of those difficult-to-categorize performers who have found a home in the modern acoustic genre. Originally from Richmond, VA, he moved to Boston for its rich Folk Music tradition and has become one of its most unique and superlative emissaries. Put simply, he is one of the finest entertainers you'll ever see. Musically, he draws inspiration from all over the map--gospel, rock, blues, Jazz, and world music. But his center is in the singer/songwriter tradition that traces it roots all the way back to the social awareness of Woody Guthrie. His central appeal is that it all comes through the singular lens of Greenway's humanity and his easy affinity for the audience. He has been described as "one of the strongest, and finest voices in folk music." The Boston Globe wrote, "Confessional one moment,rambunctiously disarming the next, few modern folk singers can own a coffeehouse stage as completely as Greenway." An October Boston Globe review wrote: "The Cape Cod songwriter stands squarely between the wistful intimacy of folk-pop and the progressive balladry of Phil Ochs and Woody Guthrie. As his new album, "Weightless" proves, his confessional style, sleek guitar, soaring voice, and pop-sweet melodicism make him an uncannily effective political singer. Best of all, he has learned Guthrie's most vital lesson: that hope is a more powerful and renewable resource than rage. Along with Greenway's five other critically acclaimed solo releases, Weightless has been well received. In September, October, and November of 2006, it was #5, #6 & #7 nationally on the Folk DJ list and has make it to the final nominations of the North American Folk Alliance's CD of the year. He has been included on numerous compilations as well, including Putumayo World Music's Shelter, Christine Lavin's Big Times In A Small Town and Laugh Tracks, Sliced Bread's Phil Ochs tribute CD, What's That I Hear, and NPR's Car Talk's compendium of disrespectful car songs, CarTalk CarTunes. Among Greenway's performance highlights are a show at Carnegie Hall in the New York Singer/Songwriter Festival which was rebroadcast on NPR's World Cafe, an appearance on nationally syndicated Mountain Stage, and a show at the Rock and Roll Hall of Fame honoring Phil Ochs. In August of 2000, Greenway was seen world wide on CNN's World Beat in a segment on socially conscious artists. 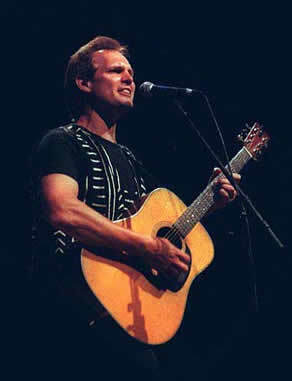 He was filmed at the Clearwater Hudson River Revival Festival performing along with Folk legend Pete Seeger and others. Greenway was featured on the weekend edition of NPR's All Things Considered. In a recent survey of Boston's premiere Folk Music station, WUMB, of all artists large and small over their 20 years on air, Greenway was picked 12th. At the end of October 2006, he was selected to sing his trademark remake of U2's, "In the Name of Love" to close a rally at the University of Virginia that featured NAACP Chairman, Julian Bond.